Find out how we generated almost 350 leads using premium content. Why did we choose premium content? Premium content helps prospects understand the value in a service or product. Discover how we developed premium content for Inspari and delivered 357 leads. Inspari is a Danish business intelligence company that helps companies optimize the way they use data. By delivering actionable data and better insights, they help their clients create a competitive advantage and run a more informed business. The goal of the campaign was to create awareness around Inspari’s services and position them as a thought leader on topics like AI and machine learning. Inspari hired Brightvision to build an inbound marketing campaign centered around creating awareness around Inspari’s AI and machine learning services and generate new leads. Brightvision designed an inbound campaign strategy to ensure Inspari’s expectations were met. Paid advertising on LinkedIn and Facebook. The goal of the campaign was to generate leads and create brand awareness. To do so, we developed a tailored inbound marketing strategy driven by premium content. Together with the client we defined the target audience and created a buyer persona tailored to the goal and purpose of the campaign. The landing page is a pivotal component of the campaign, driving leads to convert by using forms. We produced a main landing page that served as the key destination for the campaign where we hosted our premium content. Through marketing automation system HubSpot, we were able to gather data like website visits, conversation rate, list and other important performance indicators in one place. We created an initial nurturing workflow consisting of three emails, all with unique call-to-actions. Each email was tailored to the anticipated buyer journey in order to ensure high quality content as well relevance. We utilized our marketing automation (MA) system HubSpot to implement the email campaigns and create an initial lead qualification process. 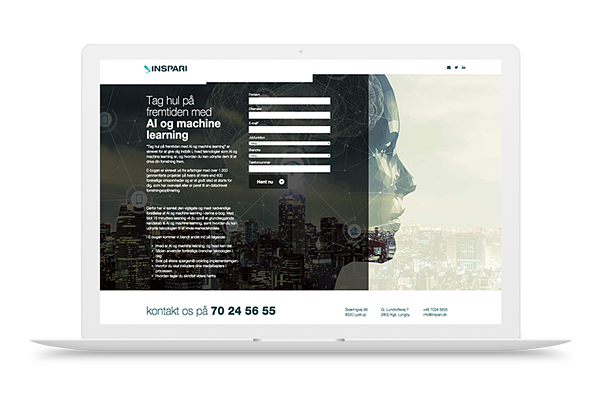 Together with Inspari we produced the eBook about AI and machine learning, which served as the key content piece in the lead generation campaign. 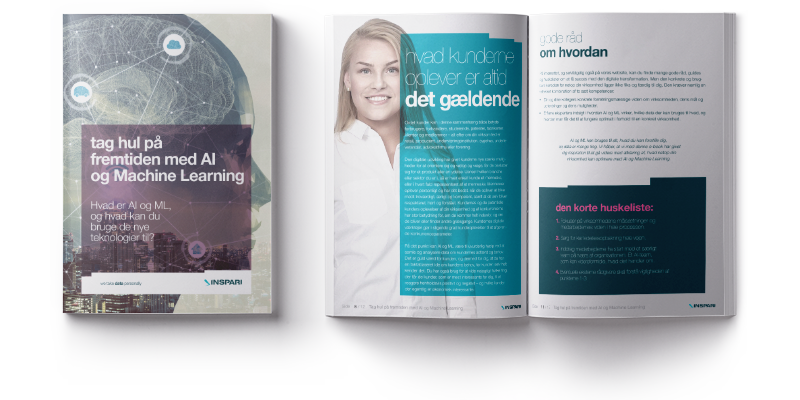 The eBook, called “Tag Hul på Fremtiden med AI og Machine Learning,” was created to help companies to take the first steps toward machine learning. To further educate prospects we e hosted a live webinar in which viewers got detailed information and practical tips on how to start their first machine learning project. 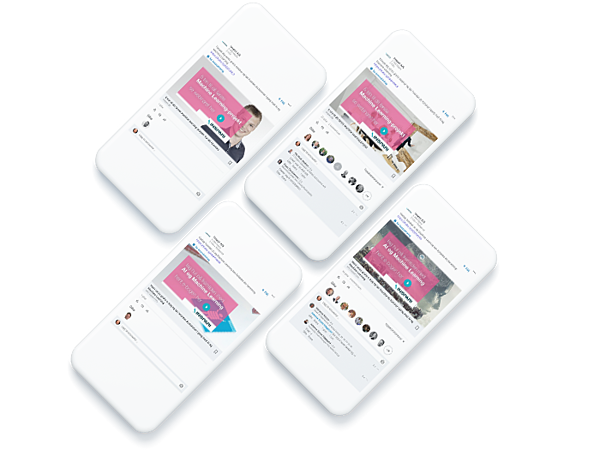 The live webinar was also used both in a direct email campaign and the email nurturing campaign. 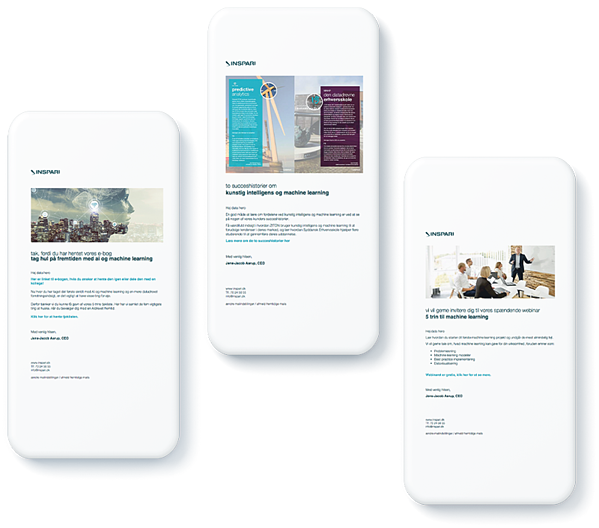 We also added two case studies to the campaign to support the eBook and create a wider context in which AI and machine learning were applied. These were included in the email prospects received after downloading the eBook. We drove traffic to the eBook landing page using sponsored ads on LinkedIn and Facebook. We customized each sponsored ad based on both the content itself and the target audience. We also used organic posts to reach existing prospects. During the campaign period, Inspari had a paid media budget of 25,000 SEK. Using paid ads on LinkedIn and Facebook, the campaign generated a total of 357 marketing qualified leads (MQLs). The eBook landing page had a total of 769 visits which resulted in a conversion rate of 19.6%. The total breakdown was 151 downloads for the E-book and 206 signups for the webinar. From this more than 20 meetings were booked. Do you want to generate more leads? We help B2B tech companies fill their sales pipeline using proven lead generation strategies. Ready to give your inbound marketing strategy a boost and increase your ROI? Book a free 30 minute meeting with one of our experts.